USD soccer moved to a 3-2-2 season record following a 1-2 loss to Creighton Friday and a 4-1 win over Green Bay Sunday. 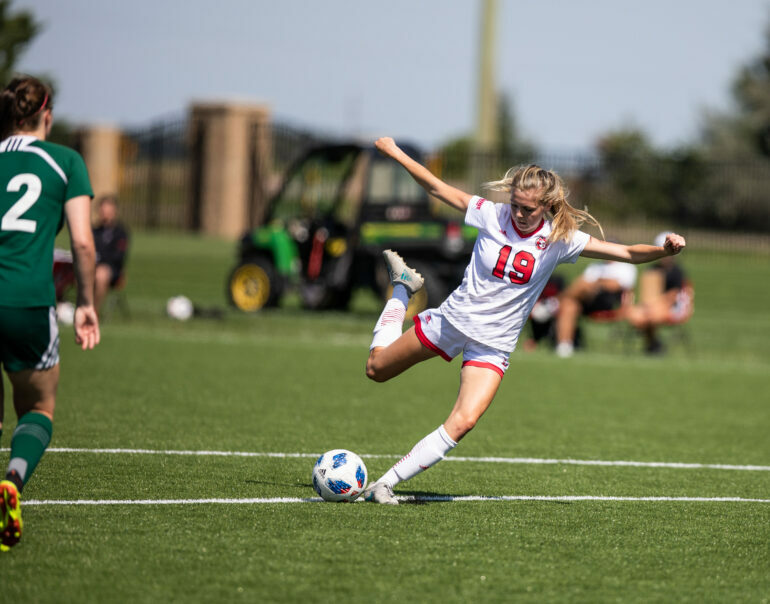 USD traveled to Omaha, Nebraska on Friday to face a 2-3 Creighton team fresh off a 1-0 win at South Dakota State on Sept. 2. Freshman Aline Reinkober gave Creighton a 1-0 lead on an unassisted goal in the fifth minute. Ten minutes of play later, junior midfielder Amanda Carpio crossed a shot from the far corner of the penalty box to the near corner of Creighton’s goal, evening the game 1-1 with an unassisted goal, her third of the season. The rest of regulation went scoreless, but in the 96th minute, Creighton Sophomore Keelie Fothergill scored the game-winning goal on a throw from-in from freshman Ansley Atkinson, ending USD’s four-game win streak. The Coyotes shot seven times, five landing on goal, and Creighton totaled 25 total shots with 11 landing on goal. Parker Rytz saved nine shots in the match, moving to fifth all-time in USD history, according to GoYotes. The Coyotes returned to First Bank & Trust Soccer Complex in Vermillion to play Green Bay (2-5) Sunday afternoon. The opening goal came in the 28th minute as junior forward Taryn LaBree scored on a rebound from junior forward Kellee Willer. The goal marked her first of the season. USD ended the first half with a 2 – 0 lead. Five minutes into the second half, Willer hooked a pass into the goal box, where freshman forward Tiannah Moore redirected in the net for her fourth goal of the season. USD had 19 total shots with ten of them landing on goal while Green Bay had eight goals with two landing on goal. Moore drove in her second goal of the day in the 63rd minute off a pass from freshman midfielder Taylor Cotter. Green Bay scored their first goal on a penalty kick in the 66th minute. Moore finished with six shots, three landing on goal, and two landing in the goal. Both of LaBree’s two shots landed on goal. USD outshot Green Bay 19-8, Parker Rytz saving one of their two shots landing on goal. Head coach Michael Thomas said he was satisfied with Sunday’s outcome. Tiannah Moore, who leads the Coyote offense with 15 shots and four goals, secured her first multi-goal game as a Coyote in the win. As of Tuesday, USD leads the Summit League with 13 goals and a shooting percentage of .191, a signal of an offense in cohesion. With three games left until conference play, Thomas said finishing non-conference play strong is important. Coyotes soccer faces Drake in Des Moines, Iowa on Thursday, Sept. 13.